Searching for a national style of art, the American landscape itself - large and untamed - was the primary focus of the Hudson River School painters. American expansion and Manifest Destiny imbued the untamed countryside with the symbolism of the country's promised prosperity and limitless resources. The terrain provided an alternative to European culture and history; it became a picturesque, patriotic, and inspirational theme. This loosely connected group of painters explored the nation, returning to their New York studios to paint large-scale works that thrilled audiences and celebrated the awesome power of nature and the progress of man. Long considered a profitable, but lowly, subject for serious artists (since it involved merely copying what was seen), landscape painting received new attention in the mid-19th century. Like Romantic painters in Britain and Germany, Hudson River School artists embraced the landscape as a meaningful subject, precisely as industrialization began to change terrains and reshape man's connection to his environment. The Americans both championed these forces of modernization and lamented what was lost in the name of "progress." Generations of American painters had returned to Europe for training and adopted the styles and subjects of Old World artists. The Hudson River School painters desired a more native tradition, painting recognizably American scenes. Personally and professionally, they formed networks with writers and philosophers to create a distinct American culture. Artists like Thomas Cole invested the landscape with symbolism, suggesting that these natural scenes could be transformed into meaningful allegories, as well as immersive and transformative experiences for the viewer. With their careful attention to realism and precise illusionism, as well as complex messaging and awe-inspiring vistas, the resulting canvases could be appreciated on both intellectual and emotional levels. The second generation of Hudson River School painters left the New York area to explore more far-flung regions of America. Their painting documented westward expansion and reinforced the concept of Manifest Destiny. During the Civil War, their majestic images of an unspoiled West provided hope for post-war reconciliation and the promise of expanses of wild country, full of promise and unscarred by battle. The Hudson River School was neither a school nor art movement in the contemporary sense of the term, but a group of landscape painters who began working in the Hudson River Valley of New York State. The name for the group has been variously attributed to either the art critic Clarence Cook or the artist Homer Dodge Martin, but, in any case, it was coined as a disparaging term in the 1870s to suggest that the group's style and subject matter were passé and provincial. Kaaterskill Falls cascades through the center of the painting, while shafts of sunlight illuminate a rocky ledge, framed by red and gold autumnal trees. A single figure, a Native American, stands on top of an outcrop, profiled against the dark caverns in the cliff behind him. The effect feels spontaneous and timeless, capturing the beauty of the scene as a natural resource. Yet, trouble looms. The painting is composed as an inverted triangle: its apex sits at the break of the falls with diagonals along the rising slopes on either side to lead the viewer to the higher falls in the upper right. Beyond this, a dense row of pines stretches along the horizon, along with an anvil-shaped thundercloud that creates a sense of impending doom. Cole revisits a subject that had previously gained him fame with his Kaaterskill Upper Fall, Catskill Mountains (1825), painted after his first visit to the area. The region, known for its natural beauty, was viewed as a kind of natural Eden, yet, at the time of Cole's first visit, railings and a bridge had already been installed for the safety of the many tourists. 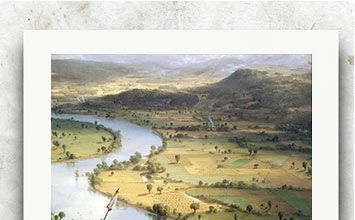 In his depiction, however, Cole erased these manmade elements and included a Native American (even though the indigenous people had been driven from the area by this time) in an attempt to reverse time and preserve the original landscape for posterity. With ambitions to transform landscape painting into a more important and celebrated genre, Cole centered his five-painting series, Course of Empire, on an allegorical cycle of historical progress. This, the first painting of the group, depicts an unspoiled wilderness at dawn. On this site, Cole depicts the rise and fall of civilization, a narrative foreshadowed by the looming storm that casts the dense forest into shadow. This gloom speaks to the demise of the unspoiled world, an ideal state represented by the hunter with bow and arrow who pursues a deer, along with an encampment of tipis and a billowing fire at the right, but it also points to the ultimate destruction of all of man's civilizing endeavors. The Course of Empire cycle, painted between 1833 and 1836, was Cole's most ambitious project to date, moving from this first work to the The Arcadian or Pastoral State, The Consummation of Empire, Destruction, and the final painting, Desolation. The same landscape, featuring the crag in the background, is portrayed in each work to convey the contrast between enduring nature and human transience. With this series, Cole felt he had launched "a higher style of landscape," a historical and moralistic allegory. Indeed, Cole's reputation beyond a mere landscape painter was established: James Fenimore Cooper praised the series as not only "the work of the highest genius this country has ever produced," but "one of the noblest works of art that has ever been wrought." Although its display in New York was considered "the most successful exhibition of works of a single American artist, ever had in this city," Cole felt that his deeper message was overshadowed by praise for the pictorial qualities of the paintings. He would later simplify his symbolism for the Voyage of Life series to make it more easily understood by the general public. Considered a masterpiece of American landscape painting from its first showing at the National Academy of Design in 1836, Cole layered geographical fact with allegorical symbolism to create a deeply meaningful landscape. Selecting a distinctive site, a bend in the Connecticut River often called "The Oxbow," Cole places the viewer in a precise location (Mount Holyoke) while alluding to the cyclical qualities of nature. The conflict between wilderness and civilization, a dominant theme in Cole's work, is portrayed in the contrast between the dense, stormy wilderness at the left and the sunlit, cultivated plains on the right. The s two worlds are bridged only by the artist's vision, represented here by Cole's minuscule self-portrait. Showing himself at work, Cole declares the artist to be a visionary, in harmony with nature. The painting was calculated to convey both civilized expansion and the untapped resources of the American continent. Although the wilderness is presented as a forest to be tamed, the brewing storm clouds and lightning-split trees remind the viewer of the ultimate power of nature. Both halves are intended to inspire awe; Cole both demonstrates the progress of man and his smallness before nature. As a viewer, we are carefully positioned within the dense forest, inviting us to partake in the sublime as experienced by the artist. Indeed, Cole traced this view from Basil Hall's Forty Etchings Made with the Camera Lucida in North America in 1827 and 1828; Hall had criticized Americans as indifferent to their native landscape, so Cole quoted his print in a depiction of the American landscape as "a union of the picturesque, the sublime, and the magnificent." Painted to commemorate the 1848 death of Thomas Cole, and his eulogy by William Cullen Bryant, this double portrait captures their likenesses and their shared dedication to the American landscape. Poised in conversation on a sunlit rocky outcrop overlooking a chasm carved by a stream, Durand creates a subtle sense of loss and nostalgia. This is particularly evident in the way the two waterfalls draw the viewer's eye toward the hazy, sunlit hills in the distance. Framed by overhanging branches and dense foliage, an atmospheric halo of light is created around the two men. They are dwarfed by their surroundings (no doubt the very attraction of this imagine location), suggesting that the fame of its human subjects is outweighed by their communion with the natural world. Durand encountered the work of John Constable during a trip to England in the early 1840s; he was impressed, describing as having "more of simple truth and naturalness than any landscape I have ever before met with." As a result, Durand adopted a more naturalistic approach in his own work, seen here in his precise depiction of the different species of trees and the flowering foliage in the foreground. Constables influence can also be detected in the humble quiet of the scene and the naturalness with which Durant stages his figures. Emerging as the second leader of the Hudson River School, Durand gradually diverged from Cole's more allegorical approach to landscape in favor of more naturalistic effects. This unusual landscape, which places industrialization at the heart of the composition, was commissioned to highlight an important new rail system near Scranton, Pennsylvania. This deliberate emphasis on the train differs from the more bucolic themes of Hudson River School painting, but uses many of the same techniques: the roundhouse is made larger to underscore the accomplishment of its construction, careful attention to accuracy creates a sense of immediacy, the harmonious relationship between man and nature is suggested in the intertwining contours and colors. The painting is divided into thirds: a young man seated on a hill, a field of tree stumps, and the steam locomotives bustling in the distance. Despite its celebration of engineering and the sense of civilizing progress represented by the railroad, there remains a sense of ambiguity. Inness makes clear how the train system scars the landscape, emphasized by the swatch of cleared trees in the center of the canvas. The arrival of the railroad is linked with the destruction of the natural environment, capturing the contemporary tension between progress and preservation of America's wilderness. The young man represents a future where the view is not the pure beauty of nature but modern technology. How this modern vision is interpreted is left to the viewer. Painted on a grand scale, Church's majestic view of Niagara Falls is depicted on an unusually long canvas, chosen to create a panoramic effect. Furthering the viewer's sense of drama, he adopts an aerial perspective that reveals a greater view of the distance and of the cascading water. The viewer feels the exhilaration and awe of being poised above the brink of the falls. Church visited the site on several occasions in 1856 to make preliminary oil and pencil sketches; the view he represents is a slight composite that suppresses the foreground in order to show a larger, sweeping vista that immerses the viewer in sublime nature. At the time, Niagara Falls was considered the greatest natural wonder of America, superior to any European site. It symbolized the nation's youth and vigorous promise. As a result, many artists in the 19th century had tried to depict the Falls; Church's work was the most successful, by far. Unveiled as a single painting exhibition in New York, Church pioneered the idea of art as an event. Works like this were debuted as theatrical productions hung in a dark room and dramatically illuminated by gaslights. His theatrical presentation included binoculars and optical aids for better viewing, chromolithograph copies of the painting for purchase, and pamphlets that reprinted praise from the critics. These shows became popular attractions. More than 100,000 people visited this painting's show; the work then toured American cities, Great Britain, and was included in the 1867 Exposition Universelle in Paris. Its impressive scale and composition continue to influence contemporary artists, including the photographs of Lynn Davis such as Horseshoe Falls, Ontario Canada (1992) and the video artist Angie Keefer, who included a projection of the falls in her Fountain (2014). Defining the American landscape as broader than the United States, Church journeyed to Ecuador to sketch the dramatic terrain. Here, the landscape is depicted as a pastoral paradise. The waterfall breaks into a deep, reflective pool, drawing the viewer's eye to the center of the canvas, where it lingers over the richness of the surrounding vegetation. In the left, a distant, snow-capped, volcanic peak rises into the sky, becoming nearly indistinguishable from the clouds. In the middle ground, a prosperous hacienda glimmers at the edge of a lake, although even its luxuries are dwarfed by the surrounding bounties of nature. Church employed large canvases to create a panoramic effect, which he amplified by including numerous small vignettes that encouraged the viewer to carefully observe the painting in sections. Botanical species and native birds are depicted with scientific detail, reflecting the artist's enthusiasm for the ideas of the scientist Alexander von Humboldt who argued that biology, botany, and geology combined to create the character of a place. At the same time, the painting is informed by Christian iconography: on the left an Ecuadorian peasant couple worship at a sunlit cross. Church positions the Americas as a new Eden. Using a ten-foot long canvas to create a monumental effect, Bierstadt transformed the landscape of the American west into a heroic, sublime scene. Although the painting depicts a camp of Native Americans and their horses in a meadow bordering a quiet pond, its primary focused is the towering mass of Lander's Peak and surrounding mountains. Filling the top of the canvas, the mountains are large and rugged in form, Bierstadt bathes them in an ethereal light, as if divine. Rather than looming ominously, the ridge suggests an expanse of space and the promise of benevolent, unspoiled terrain. The valley, with its stand of lush trees and gentle meadow, conveys a pastoral sense of harmonious nature, with the native people living in accord with the land. In 1859, Bierstadt went on a government survey trip of the West, led by Frederick W. Lander, an army officer who would die during the Civil War. Bierstadt's advocacy, including this painting, led to the naming of this mountain after the fallen colonel. The subject of a heavily-promoted, single painting exhibition, accompanied by engravings and pamphlets, this work became the artist's most successful. Despite its documentarian roots, however, the painting is a composite. In order to convey the awe-inspiring vastness and possibility of the American West (particularly significant as an alternative to the North-South divisions of the war), Bierstadt depicts an ideal landscape rather than the actual view of Lander's Peak. As historian Anne F. Hyde explained, the work portrayed "the West as Americans hoped it would be." This landscape depicts an unremarkable stretch of coastline, with its white beach and green hills curving beneath a cloudless blue sky on Long Island. The work is remarkably simplified, almost modern in its elemental treatment of forms: the land is profiled against the sea and sky, with no distractions or embellishments. Kensett creates a contemplative sense of quiet and balance. While traveling in Europe during the 1840s, Kensett had been impressed by the works of 17th century Dutch landscape artists; his later work (such as this) repeat their restrained palettes, cool colors, and rigorous composition of simple, familiar scenes. Painted in the summer before his death, this landscape depicts a scene that Kensett knew well, living on Contentment Island on Long Island Sound. This work with its smooth finish, concealed brushstrokes, and contemplative quiet exemplifies the Luminist style. Unlike other second-generation Hudson River School artists like Bierstadt and Church who favored exotic landscapes, Kensett preferred smaller canvases of understated nature that he felt allowed an intimate encounter between the viewer and the landscape. This also reflects his interest in Transcendentalism, believing that the contemplation of nature helped connect the individual to intuitive, inner truths.